Getting a Bit Lost, a Pity Loo and Patronising Apps ..
I’ve been hugely lazy so far. I’ve had almost 2 weeks off and in that time I’ve eaten fifteen – yes fifteen – crème eggs and done precisely 2 runs. Of 4 miles each. Quite frankly although I may fit into my lycra, it may well be the case that anyone that actually sees me in it may wish that I hadn’t. Enough was enough. 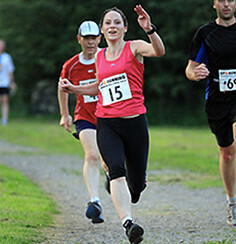 One of my running buddies WolfRunner has signed up for her very first half marathon – woo woo!! So in the spirit of helpfulness - and of not causing retching when I ran past in my over-stretched lycra – I decided to do a 9 mile run this afternoon with her. I’d worked out a really nice run - along Cycle Route 50 starting at the village of Walcote going through the villages of Swinford, Stanford on Avon , Clay Coton, Yelvertoft and ending up in Crick. 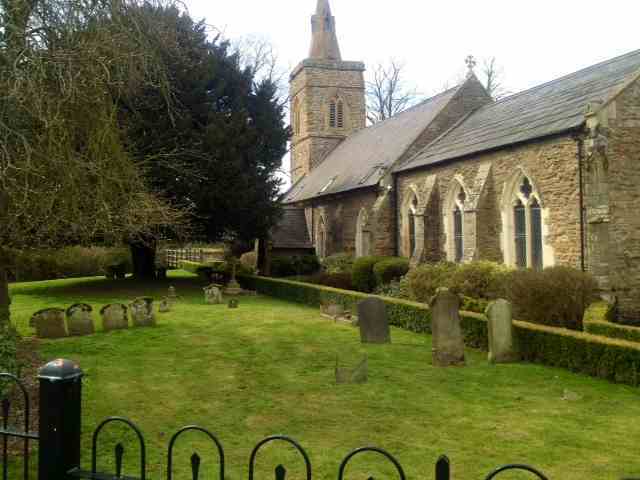 It was all through quiet country lanes and pretty villages. Perfect. WolfRunner wanted to run between 10 – 10:30 min/miles and as such had set her mobile phone to helpfully tell us the pace, distance and time every 5 minutes. It was also set up so it would tell her how far in front – or in our case behind - pace we were. I don’t know whether it’s the programme or whether the woman whose voiceover was used for the application, but I can honestly say that every time she told us we were behind pace she got more and more patronising. By the end of the run I was ready to drop kick that virtual cow-bag through the hedge and into the next county. However, I’m pleased to say I restrained myself and no mobile phones (or bloody irritating applications) were harmed during the run. However, if that woman is ever behind me in a queue at a shop or I hear her voice across a crowded room I will not be responsible for my actions. Seriously Computer-Lady, run and hide. Run and Hide. 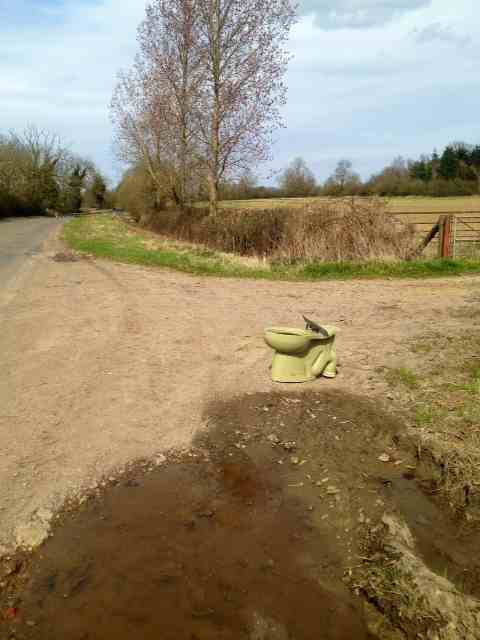 As is usually the case with me, as soon as we got into the middle of nowhere I needed a wee. I had - of course - packed emergency loo roll but decided that if I could need a wee for an entire marathon and hold it, then 9 miles shouldn’t be too much of a problem. Besides, I passed the place where I watered the hedge on the run last time and I hadn’t realised quite how … um … see through the hedges were. I got a tad embarrassed about the thought that I’d probably inadvertently flashed everyone passing by last time. It’s amazing how much the thought of past humiliation can stop you needing a wee. However, a couple of miles on we passed this. It was as if the God of ‘Holding it In’ had seen me and magicked up a Pity Loo. However, in the interest of stopping with the flashing passers by I restrained myself. Thank you for the offer but I think I can hold it this time. It was of course London Marathon day today so we had the obligatory “Lost on the way to the finish line?” and “You’re a little way from London” comments from everyone we passed (Small old man, couple with a toddler). Nice that we look as though we’re fit enough to run a marathon … even if they wouldn’t trust us enough to ask directions. I’d run this route once before and had got lost. Well a little bit. About 4 miles lost. I remembered this at the top of a big hill and stopped briefly to check the map. Ah yes … déjà vu … We’d wandered off course a bit. WolfRunner was kind enough not to swear horribly at me when we had to run back down the enormous hill I’d just made her run up (Hills are good for you, honest!). Finally found the path and realised we were already over the 9 miles I’d promised her for a run… whoops. Decided the best plan would be to add incentive and we ran to the next village and dropped in at the first pub we saw. It’s amazing the speed WolfRunner can muster when promised a drink at the next pub. We sat and drank a coke in the sunshine. Bliss. When we got back to the car I realised I had yapped the whole way. Poor WolfRunner. At least she can look forward to the relative calm of the race. Cowbells being rung, loud cheers, clapping and cheering. And absolutely no irritating running buddy chuntering the whole way round about toilet stops, gels and the importance of bodyglide. I'd like to say that the reason I haven't posted for a week is because I've been far too busy running and haven't had a chance to get to a computer because of this but ... actually I've been mostly sitting and eating creme eggs. Naughty, yes. But also flipping lovely. I've had to make up for time not eating them while training y'see. However, in fear of never fitting into my lycra again ... I have been out running (yes, yes ... ok ... only 4 miles) and will be back to normal shortly. Today was the day. The alarm went off at 5.30am after what felt like an hour’s sleep. But today it wasn’t a nuisance ... it was a call that something amazing was going to happen today. After 16 weeks training, today was the day. All the midnight runs, the miles in the snow, the times I’d had to climb into my running gear when I’d wanted to climb into bed instead. Today was my reward for all of those miles. New bands: "1 min ,3:30 = 1 creme egg" and "1800 wanted this"
We were all meeting downstairs at 7.30am and we were getting taxis to the Asics area near the finish line. It was such a treat being in the warm in the Asics lounge at the start rather than shivering in the cold. AND we had our own loo. We decided we had finally made it. This may be the pinnacle of our running careers. Our very own portaloo. Get us! Us all milling around by the taxi. We left a bit later than we should have as once we left that was it. We were on our way. I started to leave then realised under my pre-race jacket, bin bag and poncho, I didn’t have my race number on. Face palm. Undressed again, pinned number on, dressed again. Sigh. We all started walking in a civilised way to the pens, Mel got to her time pen and disappeared in amongst the crush of runners. Ady and I kept walking and all of a sudden someone started running, then the whole crowd was running. I don’t think there was any rush but it was contagious! We were all in our running gear, about to run for miles and we just wanted to get out there and RUN! We got to the pen entrance ... and nothing. There seemed to be no way in. The entire pen was jammed solid and no-one was moving. Nothing else for it ... Ady and I pushed and managed to move up the right hand side before we got stuck behind piles of discarded clothes and ponchos. The entire side of the pen was piled high with these. I was worried that it might be a bit of a trip hazard when we started moving but Ady was cool as a cucumber and said we’d be fine. He was right. A happy voice behind us and a lady introduced herself – RacingJules as I later found out! We started shuffling forward and the start line came into view ... and through! We were off! The surface flying beneath our feet as the road opened out and the crush became less ... briefly! Then back into a crush of people and past supporters lining the sides of the road. Passed a sign being brandished which stated: “Finishing is your only f*cking option.” Nope. Not finishing. Finishing SUB 3:30, but I appreciate the sentiment! It was a very crowded course, already in about mile 3 I was passing people doing about a 10 minute mile. Either they’d got into the wrong pen, or they were being VERY optimistic about their negative split. This continued the whole way around the course and it seemed as though people had either no idea of their finish times or had assumed that the pen times were optional and had just aimed for the front. Ady and I planned to run together as our finish times would be very close as we’d both trained for around 3:30. I’d assured Marathon Coach Steve that I would be sticking with 7:55 – 8 min/miles the whole way, but Ady was aiming a bit quicker and my Garmin was showing 7:45 min/miles which I was a bit concerned about this early on. However, with my pre-race nerves I’d forgotten to programme it for marathon so ended up doing this on the run which might have had something to do with it! Due to the crowds, I lost Ady around mile 4 but he reappeared just in front of me at around mile 10. He was still going strong so ran with him for a while. Again our Garmins seemed to be showing different times. Mine was showing we were running at about 8:05 min/mile and while I liked having company, I didn’t dare risk it so sped up slightly to bring it back into my time range. I missed out the first water station. The weather was beautiful with clear blue skies and bright sunshine, but I had run most of my longer training runs without water and knew I was already well-hydrated. The water stations were all mayhem. Although there were clear signs showing where they were, runners were cutting across others and tripping people up and the lids of the bottles hitting the road sounded like dominoes falling. There were plastic bottles and orange peel all over the road and I heard a runner go down behind me. I’d heard people say that this route wasn’t well supported but I found it brilliant! People were ringing cowbells and shouting “Allez, allez”. Until about mile 6, I didn’t realise this and misheard it. I thought there must have been a really popular chap called Alex just behind me. The en-route entertainment was also brilliant. There were bands and drummers frequently and it really made the atmosphere! I had previously thought marathons were meant to be hard work from beginning to end, but the enthusiasm of the bands and drummers was infectious and I wasn’t the only runner having a quick dance along while running! There were Firemen lining the streets with their firetrucks and at one point a hose arced water across the road cooling down the runners. I was hot but decided that hot was better than blisters and avoided it. Marathon Coach Steve had told me that the marathon was 2 runs. A 20 mile warmup run and a 6 mile race. I’d heard this before, but when Steve said it, it had really struck home. It really helped as it gave me a countdown. At the halfway point, instead of ‘only’ being halfway, I had 7 miles left to enjoy the trot before I could really let go and get the speed up a bit. I kept thinking like this. The speed was easily maintainable and it really was a comfortable speed. I had all of these people running with me – all of whom also loved running and I would get a big medal at the end of THIS long run! What was there not to like? My only real potential problem was a toilet stop. I had needed a wee from the beginning, but while there were plenty of urinals at the start taking care of the chaps, there didn’t seem to be any portaloos ... or any time to find any. My Garmin was on average pace per mile and distance, so if I stopped I wouldn’t be able to work out whether I would be on for my time. Right. Think positive. I’d once been stuck on the M1 for 7 hours needing a wee. This wasn’t as long as that and I didn’t have to go to work at the end of this. Positive thoughts. My evil conscience reminded me I wasn’t running on the M1, I was sitting down in the car but I ignored it. And sure enough by about mile 10 I’d forgotten all about it. I knew that this was a truly International marathon and about 5,000 of the 40,000 runners were Brits. It was lovely seeing the different club vests and the familiar charities. I saw a chap running for the Dorset Doddlers and we had a brief chat (he lived about 15 mins from where I’d grown up! ), Eynsham AC, Reading Roadrunners and a Bristol club vest. When I got to Mile 20, I decided it was time to up the speed. I’m not very good at running the same speed for a long time – treadmills are my idea of HELL – and it was nice to be able to change the speed a bit. I also knew that this was the 2nd part of the run and as soon as I entered the woods – Bois de Boulogne - at mile 21.5 I was on the home stretch. The woods were beautiful and although the support wasn’t as much here, it was lovely to run under the trees. I also found the route mostly downhill which is always a nice treat when you’re running home. I ran out of water at about mile 22 but didn’t like to throw the bottle away and I carried it as comfort almost to the finish line. I find us runners can be a superstitious lot, this bottle was empty but what if I got thirsty? I wouldn’t have an (empty) bottle to carry! It really did make sense at the time. Coming up out of the woods, I’d passed the 25 mile marker and knew I was nearly there. Cyclists had been riding up the pavements, ringing their bicycle bells, ringing us home but this was the toughest mile. I was looking out for the Arc de Triomphe as I knew the finish was near this but I couldn’t see it through the heat haze. I decided to count. By the time I reached 100, I’d be able to see the finish. I got to nearly 350 before I saw the finish. It was very low so although I’d been reasonably close I hadn’t seen it ... and the Arc de Triomphe was nearly a mile behind it. OK. I’m probably not the best person to ask for directions. Crossed the finish line. The lady beside me burst into tears. It just felt surreal. After all of this build up, all of the training, 557.2 miles run and 117 hours of training ... this was it. I had crossed the finish line. A package was thrust into my arms containing a blue plastic poncho and an electric green finishers T-shirt. I walked forward a few steps and a rotund and enthusiastic French chap placed a medal around my neck and then kissed me on both cheeks and congratulated me. A wonderful French finish to a wonderful French marathon. I had no idea of my time as I’d had to restart my Garmin and the timer on the finish gantry wasn’t working. The tracking app hadn’t updated my time so it was all a bit of a mystery. I decided to get back to the Asics area and sort it all out there. The Asics area was next to the start line, right? I started walking towards the Arc de Triomphe. Luckily before I got there I got a “where are you?” phone call. Yep. I was walking the wrong way. Asics was next to the FINISH line. Nearly 2 miles later I was walking the right direction and the cramp that had threatened my arse had disappeared. See. There can be bonuses to having absolutely no sense of direction. You get to walk off cramp. All of a sudden, a vision in a blue poncho was calling my name! Richard Langton came over and introduced himself saying he’s been following the forum. It was a lovely surprise and he had done really well and enjoyed the course too. I got to the Asics area still wearing my blue poncho. Alex and Shady Ady were already there .. and I was being congratulated. My time had appeared on the tracking application – I was sub 3:30! ... in fact was 3:25:06 !! Decided the only way to celebrate was on the roof of the Asics building with a very cold beer. We all headed up into the sunshine and watched the finishers pour over the finishing line. I would worry about that tomorrow. Tonight we celebrate. This was a nice session as it gave me a chance to have a bit of a run but with a nice long recovery in between. Perfect – almost lazy – intervals. I did these on a treadmill as the last time I’d run (Sunday) I’d cut it short as I’d had a bit of pain behind my knee and I wanted to be able to stop if this came back. But there was nothing – no twinge, no ache or anything. In fact I didn’t even think about the knee until I got back to work ... so it was obviously a Taper Paranoia twinge! Appears mysteriously and disappears just the same. 1 x interval at 5:08 min/mile (19kmph) ... it was my final interval before the Paris marathon! Had to go out with a bang!